Batman may be the worst superhero ever, but he has the best superhero games. Batman Arkham Asylum proved that with hard work and determination developers can created great games using licensed, iconic characters such at Batman. For all the huge Batman fans and collector’s, it’s no surprise that a collector’s edition of the latest game, Batman Arkham City, is in existence. If you can’t remember, Arkham Asylums collector’s edition featured a real batarang. Arkham City is going a little safer with a pretty cool statue of the Dark Knight himself. Also included are 4 collectible cards, in-game content, an artbook, and more. 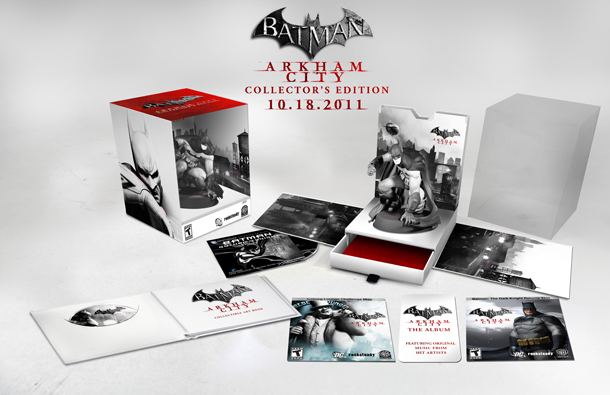 The Batman Arkham City Collector’s Edition will run at $99 and is due out on October 18th.